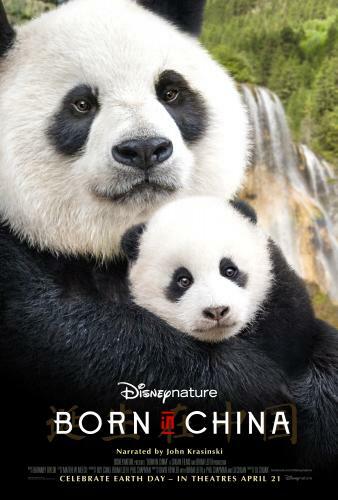 JustaBXgirl and I were invited to a early screening of Born In China and forget a build up to what we thought, we both loved it. Now, let me preface this by saying my four year old loves watching nature documentaries with her grandfather at home. If you’re not sure how your child will do with a documentary than try getting your little to sit and watch one at home first (but you should still go see this in the theater). If your child loves animals chances are they will be able to handle sitting through this film. Even with her love of animals and the ability to watch documentaries I was worried that after a long day out and a cranky attitude we might have to leave the screening early. Was I wrong?! Yup, JustaBXgirl was completely glued to the screen. She laughed at them, she oohed and she expressed concern. This film will have your emotions all over the place. We even stayed until the credits were almost over rolling with no complaints from her. The narration (as with all of Disneynature films) was on point. The landscape was beautiful. We really do live in a beautiful world. We need to start treating it better. Seeing the animals in their natural habitats is such a gift. It’s also something to see how similar we are to them. I feel like the secondary title of this film could have been “A Mother’s Love.” Watching the bonding between the animal mothers and their offspring really touched me. Especially in the cases of Yaya, the panda and Dawa, the snow leopard. These moms made me think of myself and many other mothers that I know. Yaya, is a first time mom with a curious cub MeiMei. Instinctively, Yaya knows she has to let MeiMei learn and discover life around her so that she can be self sufficient and learn to live alone one day a adult pandas normally do. Even so those mama bear tendencies kick in where all she wants to do is keep her baby safe and close. Tell me you can’t relate to that. I know I struggle with it daily. I want to give JustaBXgirl every opportunity and resource to be the phenomenal woman I know she was born to be but there’s part of me that just wants to hold onto this moment when mommy’s kisses can make the world a better place. Dawa is the other mother I could relate to in the film. Yes, I can honestly say I’m relating to these animals and I bet you can too. So much of what we do with our children comes from instinct just like them. Dawa is the mother of two precious snow leopard cubs. JustaBXgirl just loved them so. She is strong and proud and does her best to provide for her children. Sounds like anyone you know? Yet, in her part of the film we see that it is not always easy to provide for our littles. We learn through her story that sometimes providing for one family means another goes without. We learn sacrifice from Dawa. We learn that sometimes our best isn’t going to be good enough. I’m telling you there is something to learn from each animal’s story in the film and I bet the lesson I take from it might be different from the one you take but that’s the beautiful thing about art. For my boy parents out there pay attention to the TaoTao story line. He’s a rambunctious, mischievous, adorable little monkey that is going through growing pains. Once the baby his place has now been taken by his little sister. He has to find where he fits in and sometimes (most times) that is easier said than done. Our children are always looking for their place. Let’s not forget to help them find it before someone else does. I could go on and on about this movie for hours. And then I can talk to you about motherhood for hours more. Instead I will simply say go see this movie. Take your family. Talk about it. Talk about the animals. Talk about their relationships. Talk about their choices. Talk about your choices. Then tell a friend about it. If you go see it opening weekend you will be helping the World Wildlife Fund (WWF) as Disneynature will be making a contribution to them based on opening week attendance. If you can’t make it opening weekend consider going for Mother’s Day. It will be a great way to celebrate motherhood and then make your own donation. Horrible show! Ask you to help wildlife while they let the snow leopard die for ratings. Circle of life crap! Showing children it’s ok to let animals die,…what?! Evil pure evil..hated it our whole family did. Why would you give to any charity that sacrifices animals to their pleasure to proove it’s ok for them to die?! I can admit that I questioned why they included Dawa’s death in the film but I think (and these are purely my thoughts) nobody might have been on site when it occurred. Many times in nature films the cameras are left to take footage without human interference. And the other side is that it is the Circle of Life. How many animals die in the wild daily without cameras capturing it? Their deaths serve a purpose for other animals in the wild. I get your reaction though completely as Dawa’s death still sits with me and I was happy my four year old just thought she was resting to heal. I do hope that her cubs were taken care of after by the WWF.